While not without its bugs, AME is a superb collective for the metal minded music maker. 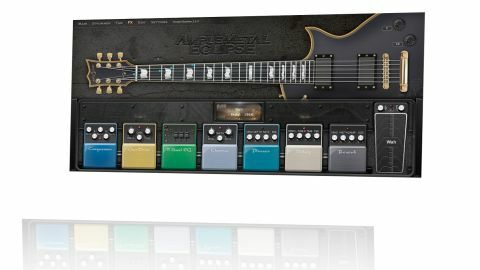 Beijing-based guitar emulation specialist AmpleSound has garnered high scores on these pages with their 'acoustic' Ample Guitar M and Ample Guitar T.
Running in the same host engine (VST/AU/AAX/RTAS/standalone), Ample Metal Eclipse is a 3.5GB virtual rendition of the ESP Eclipse I guitar, with eight articulations (Sustain, Palm Mute, Hammer On, Artificial Harmonic, Pull Off, Legato Slide, Slide In/Out) captured for every fret. Sound shaping is done via the main controls and a rack of eight virtual effects pedals (no amp sims, though - you'll need to run it through your own), but what makes it 'metal' is the sound of the guitar itself, the low default tuning (C G C F A D) and the library of metal-orientated riffs included for loading into the Strummer sequencer. Tablature in various formats can also be loaded into the Tab player, and the engine does a superb job of playing it back. AME sounds so astonishingly realistic and expressive that we can forgive its poor documentation, lack of presets and the standalone host's tendency to crash periodically.